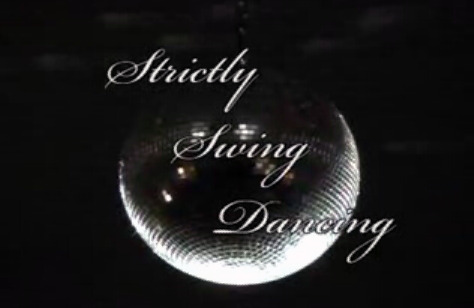 Think you know the history behind Strictly Swing? Think again! Get educated and show off some fancy moves for your friend while you're at it. Let's go back behind the scenes, shall we? Strictly Swing, I mean, Street Swing made its first debut at the US Open in 1993. Other names for this same division that were used at other events include Just Dance or Strictly Swing, the former eventually taking hold, though it was resisted for quite some years. The goal of this new division was to add an avenue for others to compete outside of the 'routine' divisions. You see, for its first decade, the US Open was a routine based competition. Showcase Division, Classic Division, Teams Division... all were based on routines. And back then, routines took A LOT of work. And the competition was incredibly fierce. To put on a good showing rather than risk extreme embarrassment (no one cheered for bad dancing back then, no matter who was out there),partners would agree to partner for the Open up to a year in advance, and then work hard and train hard that entire year to be ready for "the big show." After all, there weren't a lot of other events to choose from, and that's about how it should be for the size of the demographic that's drawn to real West Coast Swing. But it made the competitions just that more fierce. But I'm thrilled with their addition of the Street Swing category. You could pick your partner, but you didn't pick the music. Kenny Wetzel's music was used, and get this... only 15 spots were allowed. When those 15 spots were taken, they closed the registration. Other exciting factors? ANYONE could sign up. Any skill level that dared could register themselves, as long as they did it before anyone else. But once they did, the pressure was on. Why? Because every single Street Swing couple had a spotlight dance. Back then, it was terrifying. You'd be in "the pit" as we called it, and two thousand dancers with extremely tough standards would watch you. They cheered for good dancing. And if they didn't cheer? uh oh. The silence would be deafening. The idea behind the rules of Street Swing (Just Dance, Strictly Swing) was a) to give those who didn't find partners to do a routine with a place to compete (back then you could only enter one category) and b) to show off real swing. No tricks. No lifts. Just plain old West Coast Swing. And man, did the brand new category pay off, as you will soon see. As I stated, all of the music in the videos below were luck of the draw, and yet, how amazing and well-phrased all of these dances are! The leaders knew what they were doing, let me tell you. I see so many videos posted of pros performing "demo's" nowadays... pros that have been partners for years... and NONE of them look as clean as any of these amazing dancers below. All three of these videos demonstrate and awesomely high level of the Three T's: Timing, Technique and Teamwork. On the fly, their technique is awesome and their lead and follow is perfect. The men have power but so do the women. The timing, phrasing and syncopations are impeccable and the footwork is totally amazing. Clearly they practiced together beforehand, and were comfortable with each other... enough to perform under the scrutiny of the uniquely hard eye of this audience. Get to know these videos well. It will help you identify West Coast swing during social dancing, Jack & Jill's and Strictly Swings. When you see a real West Coast Swing demo or couple today, they will look much more like these below, where all of the new West Coast Swing Essentials are clearly danced, and danced well. You'll notice how incredibly different all four dances are. The music is all swing music, but watch how the dancers' individuality is allowed to be displayed, all within the confines of the rules of West Coast Swing.